For those who have asked, The Nanny Bear (aka Lucky Buddy Bear) is half Australian Shepherd and half English Shepherd. He looks exactly like his English Shepherd mother except for the patch of white on his belly and his much shorter legs. Click here to see Bear at one of his other jobs (shepherding). Click here if you want to see lots more pictures of him. Attention Dog Lovers! This Is Weekend Dog Blogging #38! To see fun dog photos and discover delicious new food blogs, visit Sweetnicks on Sunday night for the roundup. For more pup pics, head over to the Friday Ark for dozens of links to all kinds of critters. If you prefer food to fur, don't miss the always delicious and informative Weekend Herb Blogging roundup appearing this Monday at Sweetnicks. My older dog is half Aussie and half Lab and his herding instinct is pretty strong. He keeps tabs on me and whoever is in the house and when my cousin's 5 year old is here he wont let the Jack Russell anywhere near him. Nap time! Makes me think of visiting farms when I was little and playing in the big stacks of hay bales. Such fun! I love the cute round tummy on Cary. Love the pics - have been lurking for a while. Thanks for posting them all. 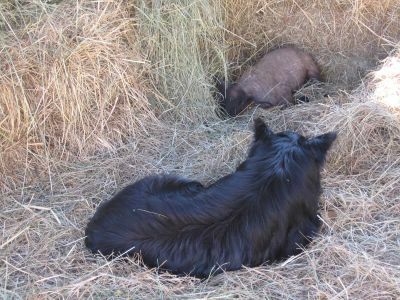 Can you recommend a book or other info on hay (growing, cutting, tools for, etc.) for someone new to farming? We just purchased a 20 acre farm, and I'd like to get some sheep (I'm a fiber artist and animal lover). I have lots and lots of books on sheep and chickens and pasture rotation... but I know *nothing* about hay, or how to harvest it! Any tips or pointers would be greatly appreciated! Have a wonderful week. So glad you enjoyed this photo. Cary and The Nanny Bear really are too much fun to watch. They adore each other. Bear is so good with her. Hmmmm. I can't think of a book on haying offhand, but let me ask Joe. Depending on where you live, hay harvesting practices can vary. Just today we were out driving around and realized that we did not see a single field that had been put up in square bales (like we put up and used to be the norm in this area). Everyone has switched to the huge round bales (usually about 5 or 6 feet tall and hundreds of pounds) that must be moved with a tractor. In other states some hay comes in giant square bales that again must be moved with a tractor. I would think there would be some haying info somewhere on the internet, maybe on a farming or agriculture site? You might try using google.com and putting in words like "hay" "putting up" "equipment" "how," etc. I bet that would get you some useful hits. I'll still see about a book. Joe might even have one that I don't know about.